The Mazda Luce is an executive car that was produced by Mazda in Japan from 1969 until 1991. 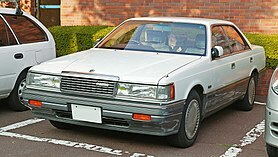 It was widely exported as the Mazda 929 from 1973 to 1991 as Mazda's largest sedan. Later generations were installed with luxury items and interiors as the Luce became the flagship offering. The Luce was replaced by the Sentia in 1991 which was also exported under the 929 name. The name "luce" was taken from the Italian word for "light". Following an agreement signed with Bertone in April 1962, the 1965 Luce 1500 show car was designed by Giorgetto Giugiaro of Italy. It was low and sharp, looking more like a contemporary BMW Bavaria than its smaller Mazda companion models, the Familia and the kei car Carol. The production version (SUA), started production in July 1966 and launched in August, had a higher roofline but retained the BMW-esque look. It was a front-engine, rear-wheel-drive four-door sedan, and featured a square 1490 cc 1500 SOHC engine, producing 78 PS (57 kW) at 5500 rpm and 114.6 N⋅m (84.5 lb⋅ft). It sold poorly at ¥695,000. The 1500 SS version with twin carburettors was introduced in June 1967, producing 86 PS (63 kW) at 5500 rpm and 117.8 N⋅m (86.9 lb⋅ft) at 5500 rpm. A stroked 1.8-liter (1796 cc) 1800 engine was added in December 1968. This new model, the Luce 1800, produced 104 PS (76 kW) at 5500 rpm and 152 N⋅m (112 lb⋅ft) at 2500 rpm. To accommodate the taller 1800 engine the bonnet on this model has a slight bump in the middle with an air inlet on the leading edge. An estate (station wagon) was also added in April 1967, with the same engine as the sedan (SUAV). Unlike most commercial vehicles at the time, it was also available with a three-speed automatic transmission. The Luce Mark I was sold in Australia and most other export markets under the names "Mazda 1500" and "Mazda 1800". The US-market 1800 produced 98 hp (99 PS; 73 kW) and 146 N⋅m (108 lb⋅ft) and cost US$2,280. Performance was sluggish, with a 0 to 60 mph (0 to 97 km/h) time of 17.5 seconds and a 20.5 seconds and 105 km/h (65 mph) quarter-mile. Unlike the rotary cars, the 1800 was a flop. Road & Track magazine said it was solid to the point of being overly heavy, with pleasant handling but poor performance. It was gone from the market for 1972. Opposite to what happened in the US, in Europe the 1800 had a better performance with 104 PS (76 kW) at 5500 rpm (SAE) and maximum torque of 148 N⋅m (109 lb⋅ft) at 3000 rpm (SAE), for a 0 to 60 mph (0 to 97 km/h) time of 13.4 seconds. The poor performance of this engine in USA was probably due to fact that in USA the petrol had an octane index of only 85 RON while in Europe the petrol at the time had an octane index of 95 RON (up to 100 RON today). Also the manual transmission with four gears used in Europe contributed to a much better performance than the three-speed automatic transmission usually used in the US. The 1800 (fitted with a manual transmission) also sold in small numbers in Australia. The number of Mazda 1800 automobiles imported into the US are as follows. The 1800 four-door sedan (model SVA) was produced from October 1968 through March 1973 where a reported 39,401 units were made. An 1800 station wagon version (model SVAV) was added in 1968, lasting until 1970. A rotary-powered Luce appeared in 1969. The Luce R130 was produced from October 1969 to 1972. It used a 1.3-liter 13A engine, which produced 126 hp (94 kW) and 172 N⋅m (127 lb⋅ft). Quarter-mile (400 meters) performance was 16.9 seconds. This model was styled by Giorgetto Giugiaro, then working for Bertone, as a front-wheel-drive two-door coupé with front disc brakes, which was similar to the NSU Ro 80. This model, Mazda's only front-wheel-drive rotary, is now a collector's item and very rare. Less than 1,000 were built. Mazda released a second generation LA2 series Luce in November 1972—a rotary powered model that would be later exported as the Mazda RX-4. The conventionally-engined Luce sedan (LA2VS) would not arrive to the Japanese market until April 1973, after starting production in March. It was available as a hardtop (coupé), "formal sedan", "custom sedan", and as a station wagon which was also sold as a van in the domestic Japanese market. The original hardtop coupé received a longer, more aggressive front design, which was also installed on the custom sedan. The formal sedan and the van/wagon received a somewhat shorter front end which was also used on the export versions (929). For the facelifted LA3 model from 1976, only one front design was used—one with a more square design. The LA2VV station wagon entered production in September 1973. The wagon lasted until 1979, until being replaced by the LA4 wagon. Two rotary engines were offered, the regular 12A and low-emission AP 13B. There were also piston models available, and van models for the Japanese market. In most export markets, the Japanese Luce Rotary sold as the Mazda RX-4. It was a larger car than its rotary-powered contemporaries, the Capella-based RX-2 and Grand Familia-based RX-3. It used the Luce chassis, replacing the R130 in October 1972, and was produced through October 1977. Its predecessor (the R130) and replacement (the rotary Luce Legato) were not sold in the United States. Mazda marketed the RX-4 as being sporty and luxurious "personal luxury car" with the RX-4 having the best of both worlds. This gave Mazda a well needed boost in the popularity of the Wankel engine unique to Mazda. In Japan, the rotary-engined variants offered an advantage with regards to the annual road tax bill in that Japanese drivers paid less than the in-line engine equivalents, while receiving more performance from the rotary engine. The RX-4 was initially available as a hardtop coupé and sedan, with a station wagon launched in 1973 to replace the Savanna Wagon. Under the hood at first was a 130 or 120 PS (96 or 88 kW) 12A engine, with the higher-powered version reserved for the five-speed GR-II and GS-II models. The extra power was due to a different exhaust and adjusted ignition timing. The emissions scrubbed "AP" models had five horsepower less, although after June 1973 they received the same power as the regular versions. This was complemented and then replaced by the larger 13B in December 1973 producing 135 PS (99 kW). This model has 125 PS (92 kW), for export. This engine was Mazda's new "AP" (for "anti-pollution") version, with much-improved emissions and fuel economy, but somewhat worse cold-starting behavior. In South Africa it was produced until 1979, all years only with the AP engine. The car used a strut-type independent suspension in front with a live axle in the rear. Brakes were discs in front and drums in the rear. Curb weight was low at 1,188 kg (2,620 lb) and the wheelbase fairly short at 2,515 mm (99 in). The body was freshened in 1976. For the United States market, the RX-4 was sold from 1974 through 1978, when the RX-7 debuted. The 13B produced 110 hp (82 kW) and 159 N⋅m (117 lb⋅ft) in United States emissions form. Base pricing was $4295, with the automatic transmission ($270) and air conditioning ($395) the only expensive options. Road & Track magazine was impressed, noting the car's improved fuel economy and price compared to the RX-3. This was notable, as the Wankel engine had suffered by the mid 1970s with a reputation as a gas-guzzler. Performance was good in a 1974 comparison test of six wagons, with an 11.7 s sprint to 97 km/h (60 mph) and an 18 s/77.5 mph quarter-mile. The magazine noted that the wagon's brakes suffered from the extra 136 kg (300 lb) weight compared to the coupé. The RX-4 was on Road & Track magazine's Ten Best list for "Best Sports Sedan, $3500–6500" in 1975. The first Mazda 929 was introduced in 1973, as an export name for the piston-engined second generation Mazda Luce. The first generation Luce had been called the "Mazda 1500" or "Mazda 1800" in export markets, but as engines of different displacement were beginning to be used across lines, such a naming philosophy would have soon become confusing. The 929/Luce was a large (for Japan) coupé, sedan, and station wagon powered by a 1769 cc Mazda VB engine. Output was 94 PS (69 kW) and 137 N⋅m (101 lb⋅ft). The Luce/929 was updated in 1975 with an optional 1970 cc engine which produced 103 PS (76 kW) and 167 N⋅m (123 lb⋅ft) from a two-barrel carburetor. The Luce Legato (introduced as the LA4 series in October 1977) was a large and luxurious sedan, still powered by Mazda's piston or rotary engines. It was also available as a four-door pillarless hardtop that looked like a huge, square coupé, and a wagon, which had more of a utilitarian role than the sedans. The coupé was replaced by the Mazda Cosmo (CD). Production of the Luce 1800 (LA4VS) and 2000 (LA4MS) sedans started in September 1977, ending in July (LA4VS) and September 1981 (LA4MS) for the Japanese market. The Luce rotary sedans, the LA42S with the 12A engine was manufactured between September 1977 and April 1978. The LA43S with the 13B introduced at the same time lasted until July 1981. While the Luce was a large, luxuriously equipped sedan, it still complied to Japanese Government dimension regulations, and it wasn't the largest sedan Mazda sold in Japan. That honor went to the short-lived Mazda Roadpacer, which was based on GM Australia's Holden Premier. This generation sedan was not sold in North America. It was originally designated as the Luce Legato, but the Japanese automobile industry authorities would not allow for what they considered a name change and so it was officially sold as simply the Luce. The "L" portion hung on though, with export models receiving the new car as the "929L". The rebodied Mazda Luce Legato became the second generation 929 in 1978 for export markets, often called the 929L. There was no coupé version developed of this generation, although a four-door hardtop body was available in Japan and some other markets including France. A station wagon was added in February 1979. The design was American-inspired, with stacked rectangular headlights and a large chrome grille. In Europe, a more efficient 2.0-liter inline-four, producing 90 PS (66 kW) with a single-barrel carb replaced the existing engines. First presented in Japan in October 1979 was a facelifted LA4 version with large, rectangular headlights and a more orthodox and European front appearance. The final addition was a 2.2-liter diesel engine produced between August 1980 and July 1981 for the sedan (LA4SS) from November 1981 for the wagon (LA4SV). Its output was 66 PS (49 kW) and 141 N⋅m (104 lb⋅ft). In October 1980, a fuel injected 120 PS (88 kW) version of the 2-liter engine was also introduced for the Japanese market; it was only available with the hardtop bodywork and full equipment. The 929 was replaced after November 1981 by the next generation Luce/929, although the second generation station wagon continued in production until March 1988 as no wagon replacement of subsequent generations was ever developed. At the time of the generational change, the diesel engine was also installed in the van (wagon) model, only available with the GL equipment level. Aside from the regular piston-engined variants, the 12A or 13B rotary engines were on offer. The piston-engined variants were exported as the Mazda 929. A rotary-engined version was exported to "general issue" countries and sold as an RX-9. Most RX-9s were sold with the smaller 12A engine. The next generation of Luce was built on the HB platform. Production started in August 1981. Exports again occurred as the 929. Japanese customers could purchase the Luce sold at the previously established Mazda dealerships, or the rebadged Mazda Cosmo sold at an exclusive dealership called Mazda Auto. Later in 1991, Mazda Auto locations were renamed Eunos. Unlike the Luce, the Cosmo was also sold as a coupé, also exported as the 929 coupé. The Luce and Cosmo both offered rotary, gasoline-powered piston-engines, and also a 2.2-liter diesel engine. An LPG-powered 2.0-liter version of the Luce sedan was also built for the Japanese market until December 1995 for taxi and other fleet usage. This generation Mazda Luce was known as the Haima HMC6470L in China and was produced from 1992 to 2002. A 2.0 or 2.2 litre engine was available paired to a 5 speed manual gearbox. It was a large front-engine rear-wheel drive sedan or hardtop sedan. The Luce was built on the new HB platform, which was now shared with the Cosmo. This version was introduced as the 929 in 1982 in most export markets and produced until 1986. Luces and Cosmos received several differing front end treatments, with export 929s receiving the very staidest front end designs for 929 sedans and the sportiest flip-up headlight "Cosmo" design for 929 coupés. No station wagon variant was issued on the HB platform; the previous LA4 remained in production as a wagon with a new front end (it was essentially the same as the LA4 from the A-pillar backwards). This generation vehicle was not sold in North America. In some European markets the 929 was badged 2000 sedan or 2000E estate (applied to a facelifted version of the previous generation). The turbo version was never offered in Europe, and neither was the four-door hardtop, although parts of Europe bordering on Eastern Europe and the Middle East did receive it. The Luce Royal Classic (and lesser-spec Limited) was more expensive than its 929 counterpart, featuring greater technical innovation—both were pillarless hardtops. The Royal Classic was factory fitted with a turbocharged 13B Rotary or 2.0-liter V6 engines, electric leather seats, digital speedometer, a cool-box for canned beverages, prominent emblems, electronically adjustable suspension and power options throughout. In order to satisfy Japanese regulations concerning exterior dimensions and engine displacement, this generation vehicle was built in two versions; the 3.0-liter V6 was installed in the longer and wider hardtop bodystyle, and the smaller engines, including the rotary engine, were installed in the shorter and narrower sedan bodystyle. Japanese owners who chose the rotary engine received financial benefits in a lower annual road tax bill over trim packages with the larger V6 engine. It was the larger model that carried over to the next platform that introduced the Mazda Sentia. 1991 was the last year of the Luce nameplate. The Eunos Cosmo was already on sale (JC), and the HD platform spawned the Mazda Sentia (now exported as the 929), and the Efini MS-9, making 1991 the last year for a four-door rotary powered sedan prior to the RX-8. In the 1990s Mazda sold the body stampings to Kia Motors who produced the HC series as Kia Potentia between 1992 and 2001—selling it only in South Korea. The export market 929 was also updated in 1986 (1987 in some markets) with the HC platform and a 3.0-liter V6 engine. The car was produced through 1991, again lagging behind its Japan-market twin, the Mazda Luce, by one year. The 929 began U.S. and Canadian sales in 1987; although predominantly available as a 3.0-liter V6, there were a rare few that made it to the North American market as a four-cylinder 2.2-liter F2 in a RWD configuration. This generation vehicle was sold in North America in sedan bodystyle only beginning with the 1987 model year; the hardtop was not available, nor were the rotary engines. Actor James Garner was used as a spokesman introducing the 929 to North America. The HC platform came out in two variations during its five-year span that had identical engines and interior but with two distinct body shapes; a pillared four-door sedan as well as a slightly larger pillarless four-door hardtop. While the pillared model was common in all countries that allowed the importation of the 929 (including the US and Canada), the pillarless model was predominantly seen in the Asian and Australian markets. The Canadian 929 came with a "Winter Package" option and included heated seats, a higher grade alternator, winter tires and non-recessed windshield wipers. A five-speed manual gearbox was an option, but most North American 929s were two-mode ('power' and 'economy') electronic four-speed automatics. Top speed was 195 km/h (121 mph). A 0–97 km/h (60 mph) time of 9.2 seconds was recorded using the manual gearbox; the automatics were somewhat slower at 10 seconds. The first 3.0-litre V6 engine seen in the 1986–1989 929 was a Single Overhead Cam type with 18 valves. When Mazda released the higher-spec 929S model for the 1990–1991 period, the engine was upgraded to a Double Overhead Cam type with 24 valves, slightly increasing fuel economy, performance and reliability. Also in the revised edition came the presence of an anti-lock braking system, ventilated rear disc brakes and a few inconspicuous changes to the exterior. The standard 18-valve SOHC remained in the base model 929. After mainstream production ended in May 1991, the HC remained in production until January 1996 for taxi applications in Japan. When the HC series Luce was replaced with the Mazda Sentia, it continued to be manufactured in South Korea at Kia Hwasung plant as the Kia Potentia. The Potentia was produced from 1992 until 2001 using the 2.0-liter four-cylinder Mazda FE-DOHC engine—which was the same as used in the first generation Kia Sportage's gasoline version—a 2.2-liter four-cylinder, and a 3.0-liter V6. The V6 model was called the President trim level. The Potentia was replaced by the Kia Enterprise, which was based on the Mazda Sentia and introduced in 1997 after the Sentia was cancelled. Wikimedia Commons has media related to Mazda Luce. ^ a b c d e f g h i j k l m n o p q "車 種 型 式" [Vehicle forms] (PDF). Miyaco Jidosha Kogyo Kaisha. Archived (PDF) from the original on 29 January 2016. ^ Australian Motor Manual's Road Test Annual. 1967. pp. 69–70. ^ Green Book Price & Model Guide. March–April 1984. p. 59. ^ "Mazda 1800". Unique Cars and Parts. Retrieved 2014-08-06. ^ Long, Brian (2004). RX-7. Dorchester: Veloce Publishing. p. 20. ISBN 1-904788-03-3. ^ a b c d e Fuji, Shigeyuki. "Big Rotary マツダ ルーチェ　MAZDA LUCE/RX-4）【LA22・33】". '70年代　旧車の世界　Old cars of Japan '70 (in Japanese). Retrieved 21 January 2016. ^ "Mazda 929 (LA2)". GoAuto. Retrieved 7 August 2014. ^ "自動車ガイドブック: Japanese motor vehicles guide book 1973/1974" (in Japanese). 20. Japan: Japan Automobile Manufacturers Association. 30 October 1973: 90. ^ Robson, Graham (1990). A-Z of Cars of the 1970s. Haymarket Publishing Ltd. p. 102. ^ Yamaguchi, Jack K. (1978). Lösch, Annamaria, ed. "Successes- Excesses". World Cars 1978. Pelham, NY: The Automobile Club of Italy/Herald Books: 64–65. ISBN 0-910714-10-X. ^ Costa, André & Georges-Michel Fraichard, ed. (September 1980). "Salon 1981: Toutes les Voitures du Monde". l'Auto Journal (in French). Paris: Homme N°1 (14 & 15): 121. ^ "Mazda 929 (LA4 929L)". GoAuto. Retrieved 29 January 2016. ^ "Mazda 929 Generation 2". Unique Cars and Parts. Retrieved 6 August 2014. ^ Bellu, René, ed. (September 1990). "Salon: Toutes les Voitures du Monde 90/91". l'Auto Journal (in French). Paris: Homme N°1 (14&15): 301.